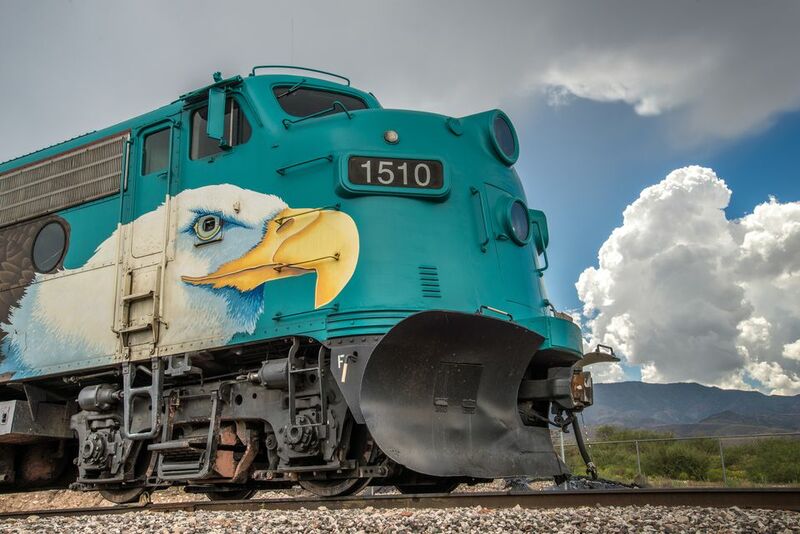 For many years the Verde Canyon Railroad in Clarkdale has been pleasing Arizona residents and visitors with its magnificent views, unique environment, and historical perspective. The train travels through an area that was once rich in mining activity, and even prior to that, was the home of the ancient Sinagua people, whose cliff dwellings can still be seen. Keep in mind that the Verde Canyon Railroad excursion covers about 20 miles at a speed of about 10 MPH; the roundtrip is about four hours. For the first part of the trip, narration is provided over the sound system; they provide information about the trip and special points of interest are explained. After the first two hours, when the train turns around and heads back to civilization, there is less talk and more background music; people were definitely quieter and there was quite a bit of napping going on! I found this to be the opportunity to put down the camera, and just enjoy the surroundings without a lot of the details. We traveled first class and appreciated the very comfortable sofa-style seats as well as the complimentary hot and cold buffet. On this trip, they served meatballs, chicken wings, veggies with dip, cheese fruit, and muffins. Although we had purchased brown bag lunches at the depot, it turned out not to be necessary. In first class, they also offer one free soft drink upon departure. If you choose not to go first class, the seating is more bus-like. The good news is that no matter where you are seated, you have access to an open-air car, so you can walk in and out, get photos, see the sights, and then go back inside your railroad car and relax. A magazine that describes the history and views at each of the 21-mile posts is available for purchase at the depot. The magazine makes a great souvenir. The Verde Canyon Railroad runs year-round on a varied schedule according to the season. Advance reservations and prepayment are required to reserve space on all trips. Extra trains are added in March, April, October, and November. Starlight tours run from May through October. One can also arrange to use the Verde Canyon Railroad for special events, like conferences, parties, and weddings. Visit the Verde Canyon Railroad online, or contact them by phone at 1-800-293-7245 for prices and schedules. There is no smoking on the train, even in the open-air cars. At the end of the first half of the trip, when the train heads back in the reverse direction, passengers may smoke while the train engines move to the other end. There are reasonably priced snacks and beverages including bottled water available for purchase on the train. Many people buy one of the brown bag lunches and eat them prior to boarding the train. Don't forget your camera and your binoculars! Get there at least an hour before scheduled departure. The gift shop has nice items for sale, and it will take a little while to browse. There is also a small museum with displays of the history of the train and the area that you can peruse while you wait. People will start to line up at their assigned rail cars about half an hour before loading time. Loading time is about 20 minutes before departure time. Why line up? Because although the seats are all good (and the open-air cars are your best bet for photos and viewing the beauty of the canyon) the seats on the right side -- the conductor's right -- have a better window view.